A freelance Java developer claims it took him only 30 days to build and launch a basic open source office suite that runs on multiple OSes. Called Joeffice, it works on Windows, Mac OS X, and Linux as well as in browsers, according to the developer, Anthony Goubard. 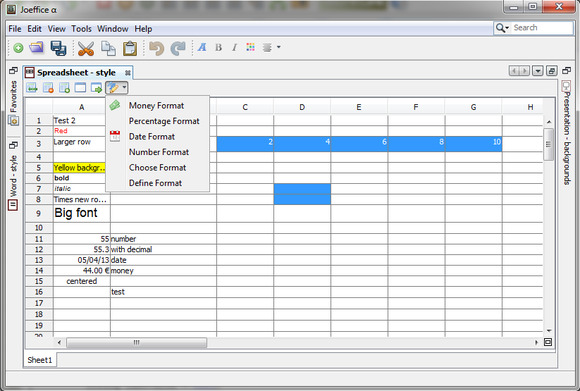 It includes a very basic word processor, spreadsheet program, presentation program and database software, Goubard said. The office suite was built with NetBeans and uses many popular open source Java libraries, Goubard said. That allowed him to built the program in 30 days, he said, a process that he documented daily on YouTube. The suite was released as an alpha version, which means that not everything works yet, Goubard said. His Amsterdam company, Japplis, launched the suite, which is available under an Apache 2.0 license. This license allows companies to change and redistribute the code internally without having to share the new code publicly, he said. Goubard, a French citizen, has been living and working in Amsterdam for 14 years. He chose Java for his project because it works well on different platforms, adding that he hopes to make the suite available on mobile platforms and possibly the Raspberry Pi credit-card size PC. "The suite is meant for companies with specific needs," such as obtaining data from a Java library, he said. He hopes the alpha release will trigger interest from other developers to improve the suite. If all goes well, Goubard aims to release a full version of the suite next year. Joeffice is meant to eventually compete with Google Docs and will never have the extended options used in Microsoft Office, Goubard said. It will also remain more basic than other open source office suites like LibreOffice and OpenOffice.org, he said. Joeffice was made available for download and requires Java 7.